I am a huge fan of transparent products. I was especially excited to see Heidi Swapp produce transparent plastic letters again and I was thrilled when her team asked me to create a layout using her new Clear Pop products. 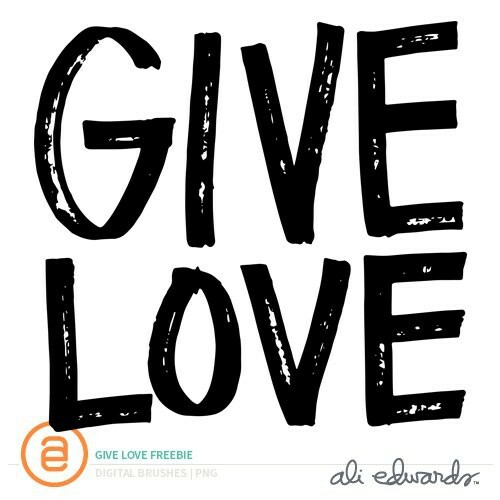 Be sure to check out her blog and website for a ton of inspiration and information. If you haven't see when she's doing with Memory Files you are missing out. This layout showcases two photos I took on a recent "everyday" around here. Simon was having reading downstairs and Anna was having quiet "look at books" time in her bedroom. I loved capturing each of them in these spaces as reading is a pretty important activity/lifestyle here at our house. This layout started with two of Heidi's pattern papers cut to 12 inches x 6 inches: Softness (blue) and Lovey Dovey (pink). I used washi tape along the seam on the back to hold them together. 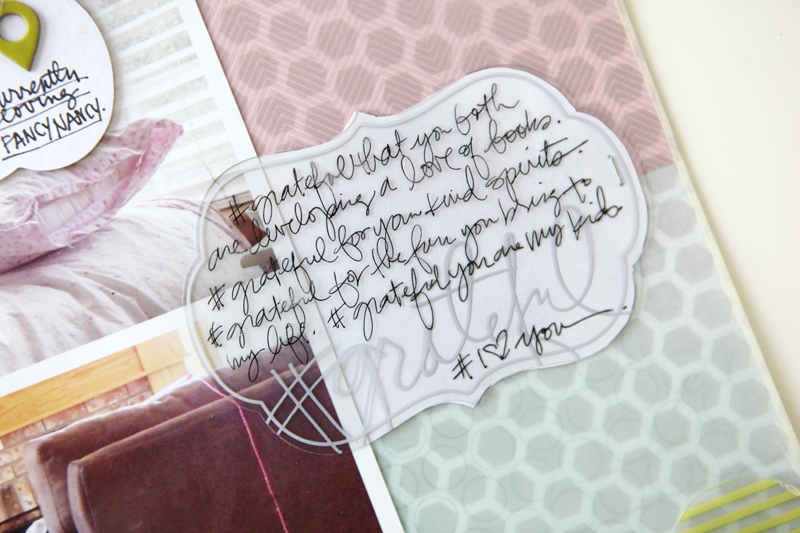 On top of those pattern papers I added some hexagon vellum from Studio Calico's April Scrapbook Kit (Spencer's) and my two photos that were printed out together here on my Epson R2000 printer. 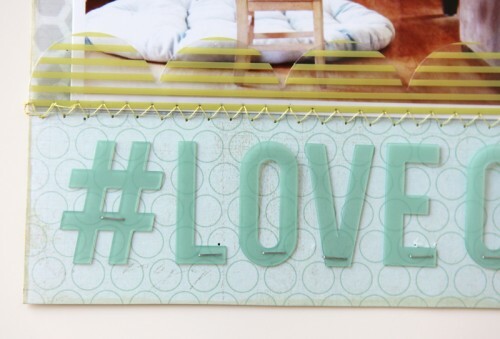 The next layer is the two transparent Color Pop 12-inch banners (love these - so awesome) - one along the top edge of the photo/vellum and the other along the bottom edge. Those were attached using my Brother sewing machine. 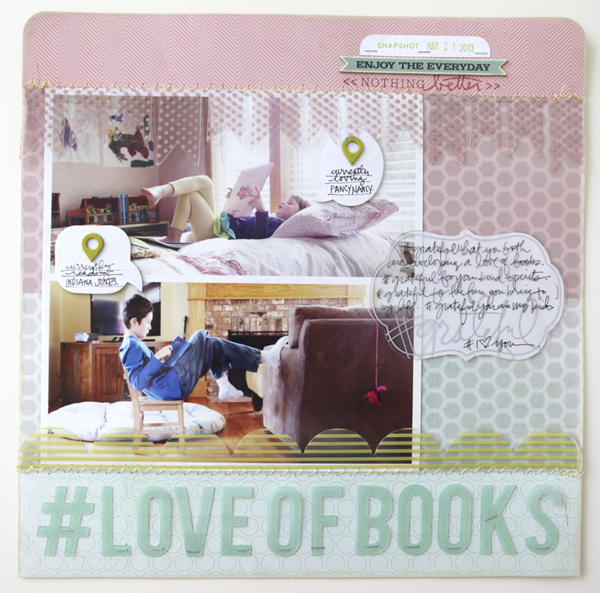 The title #loveofbooks was a take-off on the great #grateful transparent element from the set of Clear Pop Clear Tags (the package includes 8 designs even if only 4 are shown on the preview image). I ended up adding my journaling right on top of that piece - but before I did that I took a piece of white paper and cut it to the same size and shape and slipped it under the transparent element to help the readability of my handwritten journaling. To show that it's a transparent element I placed the left edge on top of my photo. The top cluster of embellishments includes one of the stamps I designed for Technique Tuesday (Super Fantastic), a chipboard sentiment from Simple Stories 24/Seven 6X12 Chipboard Stickers, and a piece of a journal card from Project Life with a date/sentiment stamp added (Ready Set Go Rolling Stamp from Amy Tangerine/American Crafts). The speech bubbles are from Pebbles and I actually used the back side (white part that's actually covering up the adhesive) vs. the chipboard side. I added chipboard location tags from Studio Calico to each and then hand-wrote what each kid was reading at the time. I use Precision Pens from American Crafts for my journaling. I used a Tiny Attacher to adhere the Clear Pop Clear Mint Alphabet. Click on the images to link to the products. Loving the soft colors and the transparencies! Lovely layout! wow, this is crazy in an awesome way!! You are on fire!!! Look at you go. I'm so happy for you to be creating and playing more. 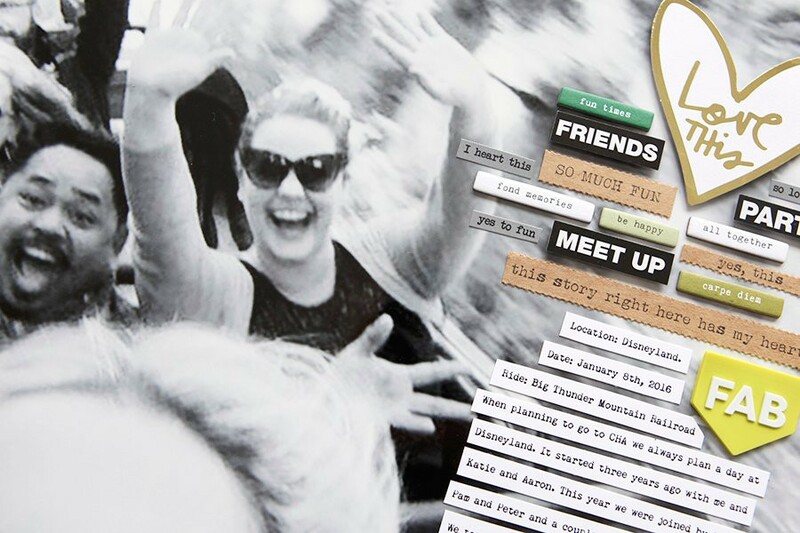 I have missed seeing your creativity spilled out on scrapbook layouts! You are such a great inspiration to us all. Thank you!! So good to see your creativity manifested in a traditional layout. Perfect.....shows off your artistry. 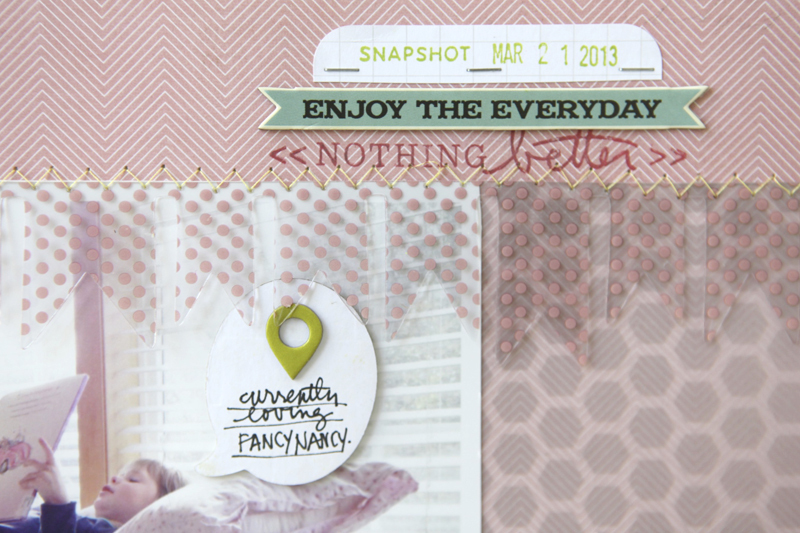 I am loving seeing your traditional layouts again. You definitely haven't lost your touch. 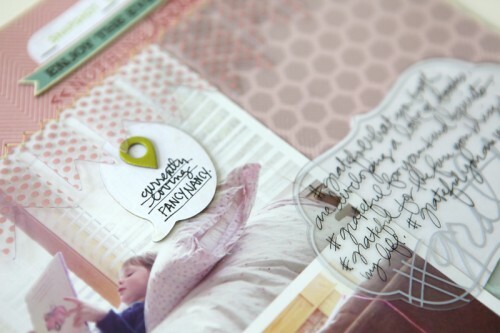 My scrapbooking ebbs and flows as well, but love it too much to ever stop. Such a beautiful page. Must be some great new floors!!! lol Please keep enjoying the process, we are benefiting from your UPstanding work. Have a great day. that last comment was supposed to reference last years OLW. Your OPEN ness of this years OLW is jumping off the page. super cute; Anna has such long legs, getting sooooo big!!! I am currently undertaking project 12 and including my Library receipts to record the books I am reading over the year. It was a great idea by my 7 year old nephew and I am already loving it. I just bought these HS tags, thanks for the inspiration! I'm glad she's coming back with some of these go-to products. Details, you'll see a little box to the left of the subject	https://trackings.co	USPS, UPS, and also FedEx. A global tracking solution.